Gero Verheyen’s travel and nature photographs are on display at the Enoch Pratt Free Library in downtown Baltimore. The exhibit is on display in both the Fine Arts Reading Room and the Maryland Reading Room. Both black and white and color photographs are included. Moments in Time: the Landscape and Wildlife Photography of Gero Verheyen will be at the Central branch of the Enoch Pratt Free Library from Saturday, Feb 18, 2012 to Saturday, Apr 21, 2012. The photo display in the Maryland Reading room focuses mainly on local subjects and is displayed on top of the rows of file cabinets, at just above eye level. Subjects include scenes from around Maryland, from Baltimore City to Assateague Island. The soft pastel colors of “Tulips, Sherwood Gardens” contrast with “End of the Line”, which is a black and white photo depicting a battered streetcar. Birds, such as “Bald Eagle in Flight” and “Osprey Fishing” remind us of the variety of nature in Maryland. In “Cogs” and “Rails” Verheyen uses black and white to highlight details of industrial subjects. “Arctic Fox” serves as a link to the group of more globally themed photographs in the Fine Arts Reading Room. The photographs in the Maryland Room show both American and international subjects. “Storm Clouds Over Paris’, “Monticello” and “Forbidden City, Beijing” represent Verheyen’s extensive travels. The color photos are very vivid in this group. “Cabin at Chincoteague”, while not a Maryland subject, is reminiscent of the photos in the Maryland Room. The photos are displayed on the ends of the bookcases and are not readily noticeable. Make sure to look for them as some blend in with the décor. Gero Verheyen is a Baltimore resident who has enjoyed photography since childhood. His specific interest is nature, particularly wildlife, but architecture and travel also inspire him. You can see more examples of his work on his official website, Ars-Natura. 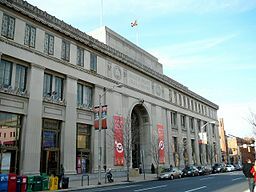 The Central Library branch of the Enoch Pratt Free Library is located at 400 Cathedral Street in Baltimore City. It is open from 10AM – 7PM Monday through Wednesday, 10AM to 5PM Thursday through Saturday and 1-5PM on Sunday. (Sunday hours are only from October through May.) The Maryland Room is located on the second floor of the Annex. The Fine Arts Department is on the second floor in the main section of the library, across from the Poe Room.